The golden bike tunnel between the Meeuwerderweg and the H.L. Wicherstraat in Groningen will be closing for good on Monday. The tunnel was scheduled for closure a while ago, but recent cold weather delayed those plans. 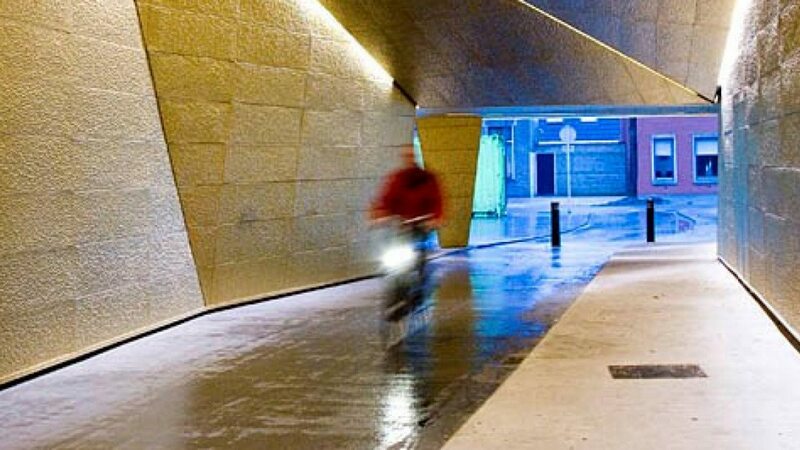 Starting on Monday, cyclists can travel under the ring road via the Oude Winschoterdiep and the Verlengde Lodewijkstraat. The tunnel, which cost one million euros and was built in 2009, has to close due to road works on the southern portion of the ring road. The road works plans were already known when Thomas Müller, a German architect from Berlin, was hired to design the tunnel. Müller also designed De Frontier apartment complex and the eastern side of the Grote Markt. An underground tunnel will eventually be built at the same location. A new park, the Zuiderplantsoen, will also be built in the area.